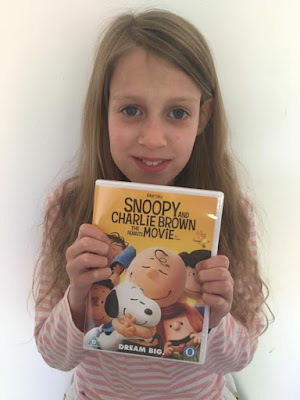 Mum of Five Staying Sane: Our review of Snoopy and Charlie Brown; The Peanuts movie, available now on DVD and Blu-Ray. A fab, fun film for all of the family. Our review of Snoopy and Charlie Brown; The Peanuts movie, available now on DVD and Blu-Ray. A fab, fun film for all of the family. With a wide range of ages in our household it is difficult to find a film that all of the children will want to sit down and watch. However, The Peanuts Movie was a hit with everyone. Whenever a film gets put on there is always a grumble either because it isn't appropriate for the younger ones or the older ones are 'too cool' for a kids film now! When The Peanuts Movie arrived I was unsure what reaction it would get. It was my youngest, aged 3, who was the first to request to watch it and that was as soon as he took it out of the postbox! With children aged 3, 6, 9, 12 and 19 they all want to watch different things all of the time. There are only a few films that they are all happy to watch together and luckily this kept them all entertained. It is such a sweet film as Charlie Brown tries to get the attention of the new girl in class. He is such a shy character yet tries to do some lovely things to win her attention. Learning to dance for the school Winter Dance and writing a book report whilst she is away from school. Inevitably, things go wrong and his things don't go to plan ending in disaster. Then he gets a perfect score on his test paper but when he realises there is a mistake should he own up or gain the love of his life?? Snoopy, as always, tries to help out Charlie Brown as much as he can as well as writing his own love story on a typewriter about a beautiful dog. This is such a sweet film with Charlie Brown making some cute, yet funny mistakes whilst trying to gain the new girls attention. The film also features all of the other characters such as Peppermint Patty, Marcie, Linus and many more. We received the dvd only a few days ago and it has already been watched around 8 times that is how much they have enjoyed it. Sometimes Thing 5 will watch it on his own but all of the children have sat and watched it together and they all thoroughly enjoyed it. There were no early exits to go and find something else to do which sometimes happens with other films. Whether you are having a movie night or a rainy day movie time, we would highly recommend this film to all ages.